A busy off-season should help the Mariners get back above .500, but the production may not be there for Seattle to return to contention. This week, SI.com is previewing all 30 MLB teams for the 2016 season, counting down to the No. 1 team in the league. At No. 16: the Seattle Mariners. Poised to break what is now the longest postseason drought in the majors at 15 years, Seattle had a productive off-season under new general manager Jerry Dipoto. The club signed Nori Aoki and Leonys Martin to bolster what was a weak outfield, and both should fit in nicely on the bookends of what is, on paper, a strong lineup. Fellow winter addition Wade Miley will provide stability in the back end of the rotation. Aside from Nelson Cruz and his career-high 44 round-trippers in 2015, there wasn’t a whole lot to be excited about from an offensive standpoint with the Mariners last year. That should change this season with a healthy Robinson Cano, who battled a stomach ailment and a sports hernia for most of last year. Kyle Seager, meanwhile, saw a slight regression in his production despite a solid line-drive rate; he should see a return to form if he can get some better luck on batting average on balls in play (his .276 mark last year was 20 points under the league average). In the rotation, Dipoto gave Felix Hernandez some needed support with the re-signing of Hisashi Iwakuma and the addition of Miley. 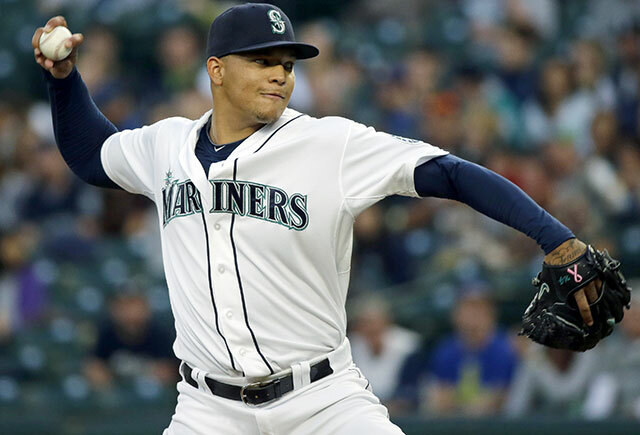 King Felix posted a putrid 4.48 ERA in the second half last year, which could be the beginning of an ugly decline. But if those post-All-Star break struggles were merely a speed bump in what's been a dominant career, then this season should be a fruitful one for the team’s rotation. There does exist the possibility that Hernandez is worn out. The veteran righthander will be 30 in April, and he’s thrown an ungodly amount of innings over the course of the last seven seasons, including a league-leading 249 2/3 in 2010 and more than 230 frames in five out of the last seven years. Decline happens to everyone, and it’s only a matter of time before King Felix decides to abdicate his throne. While a bad season from Hernandez is a tough sell, a wobbly campaign for the Mariners' bullpen is not. Steve Cishek blew five of the nine save opportunities he had last season with Miami before the Marlins demoted him, rookie righthander Mayckol Guaipe is unproven, and while Joaquin Benoit has held off Father Time for years, asking a 38-year-old to be your top reliever is certainly a gamble. It’s time for someone here to break out, whether it’s Guaipe, lefty Charlie Furbush (who missed a large chunk of last season with a rotator cuff injury and will start the season on the disabled list) or hard-throwing righty Tony Zych. It seems like Walker has been on the verge of breaking out for three years now, but he’s only 23. Packaged as a future ace, the flamethrower came up at the age of 20 in 2013 and hummed along in short stints before finally taking on, and fumbling, a big workload last season. Walker had his flashes, but ultimately his 4.56 ERA left already-depressed Mariners fans sinking deeper in their chairs. Considering the end to Hernandez’s 2015, Walker looking the part of a future No. 1 would settle many stomachs in Seattle. After starting with a 7.33 ERA in seven starts, he did post a 1.68 ERA over his next seven, and his 169 2/3 innings did feature 157 strikeouts. He got hit hard last season, there’s no way around it, but if he can cut down the gopher balls (1.3 per nine) and retain what was a solid strikeout-to-walk ratio (3.93), he should be fine. Walker is firmly in the conversation for the league’s biggest breakout of 2016. In 2015, Cano drove in just 79 runs, a seven-year low, and the 33-year-old has seen his season RBI totals deteriorate since his move to Seattle from New York. The addition of Aoki coupled with the consistent production of Seager, however, should help Cano return to the RBI levels to which he is accustomed. "This is a guy they raved about with a big arm, they thought he could pitch in the middle of the rotation, but he just hasn't been able to live up to expectations. He could find himself in the bullpen." "This dude hits third or fourth in most lineups. He may not get the notoriety he probably deserves.​"